If I've said it once, I've said it a million times, I'm still searching for that forever job. I've sent my resume countless places, tweaked it easily four thousand different times. I have a folder on my computer that has no less than twelve different versions I have updated in the past year. I hate resumes. 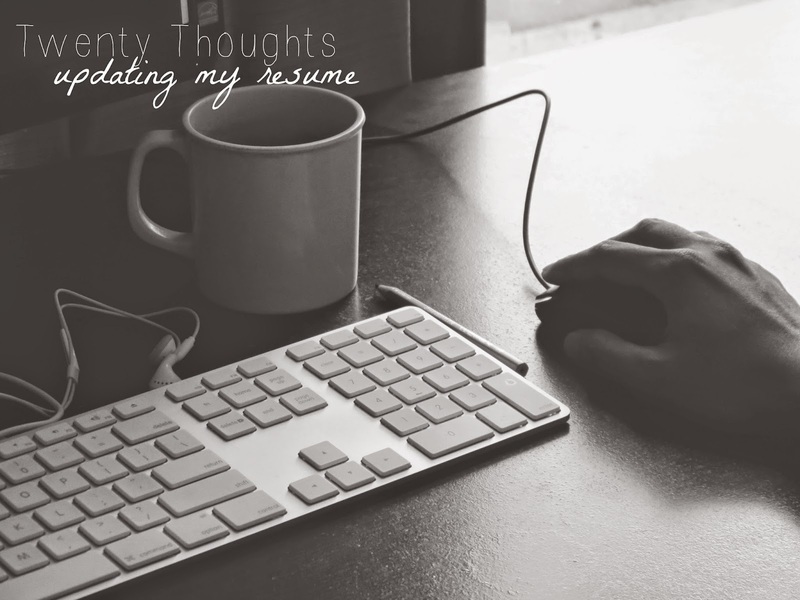 During my last update, I jotted down my thoughts while trying to update my resume for yet another round of job applications. I hate that they're not supposed to have color. Black + white is so not my vibe. I don't think I can be described in bullet points, no matter how much I like to use them here. I genuinely cannot pick a font that is easy to read, fits with all of the information I have to put on one page, and also somehow helps me stand out. I always feel like I could explain any of the bullet points in so much more detail if you would just talk to me. I would gladly make a video resume if that was a legitimate thing. All of my recent volunteer work was done through my previous jobs, not a volunteer organization but I can't really put that into words for you. I haven't held a leadership role in any community positions because my career path causes me to move around keeping me from making two or three year commitments, but there's not a way to put that on there. What if this hiring manager only reads resumes in Times New Roman. Why why are there so many fonts? I really love fonts guys. I know my internship was four, almost five years ago, but don't they need to know I worked my way up? I started out unpaid? Do I give my major GPA or my cumulative GPA? because they're very different. If I give my major GPA because it's higher, will they think I'm hiding something? If I give my cumulative GPA will they think I'm an idiot since it's just barely over 3.0? Accounting was really hard at UGA. So were all of those classes I took when I was an engineering major. Are you sure I can't make my name like a logo? Can't I make it red? That would be so pretty. What if the hiring manager spells his name Casey + thinks I spelled mine wrong? Should I try to go by Kathleen? Is Kathleen more professional since it's my legal first name and Kasey is just what people call me because you cannot shorten it to Katie? Oh wait I can't go by Kathleen because of what happens when you google search Kathleen Decker you get all of the stuff about that one Nets intern..
What if the hiring manager went to UF and throws my resume away because I was told to put my education first instead of last? Should I reword the description of this event to focus more on my skills under pressure rather than the size and moving parts of the event? Does it sound braggy if I say it had the largest turnout in the history of the event? Or does that just show I did a good job? OH NO. Did I spell "detail oriented" right? Did I even put that on there? Do all of these bullet points line up? Crap what happens if they google search and end up on my blog and they don't like that I said I didn't like to wear shoes in my "about me" section? Oh, what happens if they go to my blog and see this list I should probably stop making this list. As I was making this list the other day, I was also working on my cover letter. Can we just talk about how cover letters are the worst? Just read my resume, if I meet the qualifications, call me. What do you stress about when making your resume updates? Any suggestions? Also, linking up for Listed Tuesday, because obviously. I hate doing any sort of cover letter or resume. Whenever I need one, I make my husband do it for me. It's easier for him to bullet point what I'm good at and then "sell" me in the cover letter. I think I over think it too much. somehow I've become the person people come to for help with theirs, I guess since I write so much here? I've been told I do the opposite, I have a tendency to undersell myself because I'm terrified of sounding braggy or something..
HA! I have to update mine soon and I have been putting it off like the plauge. I hate even thinking about it for some reason. Ugh, I agree with all of this. I'm employed at a temporary position, which totally sucked because not only do I have to continue applying for jobs even though I got one, but I ALSO had to add a whole new position to my resume. (I mean, obviously that's a good thing, but writing out those bullet points? No thanks! lol.) The job search process is the absolute worst. I so feel you. and it's so much harder to add a position that doesn't really have anything to do with your career into it! like the job I'm working now looks so out of place with all of my other experience! ugh. Resumes and cover letters are the worst. When I had to find this job, I stressed SO MUCH about my resume. ("should I really put I worked for an ISO 9001 certified employer?") What I hate most about my resume is that I have a LOT of experience in different fields, but apparently that doesn't translate well to "quick learner" / "able to adapt to new situations"
IT SHOULD THOUGH! I'm always worried that it looks like I can't commit to a job because I've had to move around so much. Wait, why can't resumes have color? - Says the girl who never had a big girl job. I don't know. I'd be totally into colors if I were hiring people. I used to incorporate red into my resume, until last year an HR professional told me it wasn't a good choice. big girl jobs are overrated. $5 says that HR professional wasn't a Georgia fan. Ugh, this gives me anxiety. I need to update mine and I am dreading it. Literally 4 years of my life consisted of job hunting and constantly tweaking and sending my resume. Needless to say, I did not graduate law school during a time that the job market was great. I took the job I have now after burning out from practicing family law and always intended to look for another job in the mean time while this one paid the bills. I've been at my job almost 3 years now, not only because I enjoy it, but also because I never ever want to have to update or send out my resume again. Job hunting is the worst. And the expected structure of legal resumes is so ridged, there is no zero for personality. And I hate having to make it all fit on one page. It is IMPOSSIBLE. THE ONE PAGE THING! I know, I don't want to look at more than one page either but there's so much I need to put in there. I can't even imagine having to work in a bunch of legal information, that sounds like a nightmare. it is definitely my nightmare..
Weekly Wishes + A Giveaway! I'm Running Out Of Creative Confessions Titles..
17 Thoughts at 3 AM. How To Not Be A Big Fat Jerk in Three Easy Steps!